Older people are designing campaigns to make Leicester more age-friendly and taking action to develop friendly and inclusive communities. 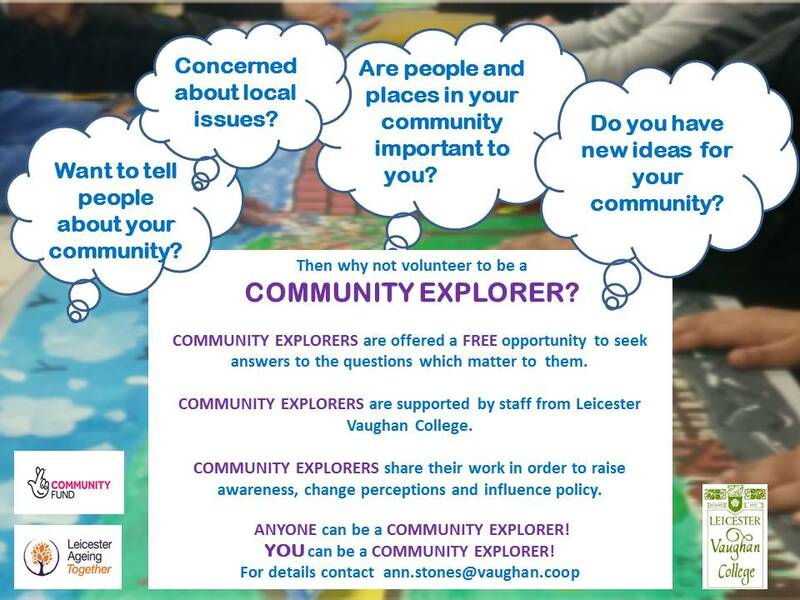 LAT are working with Leicester Vaughan College to develop a Community Explorers project to promote more community-based research opportunities. Research shows that learning helps people to respond positively to change in their environment and circumstances, to remain engaged in society, and to remain physically and mentally active. Community Explorers will work collaboratively using participatory action research on the issues that matter in their communities. They will share their learning through ‘table-top’ displays, encouraging dialogue with others. Community Explorers will be supported to develop ideas for learning projects individually and in small groups, and share their ideas in creative ways e.g. by creating posters, films, and poems and through conversations with others at events or in cafes. Community Explorers will be introduced to ways to keep themselves and each other safe, and to make sure everyone is treated fairly in the project. For more information, or to find out how to join the Community Explorers (open to people 50+) please contact Ann.Stones@vaughan.coop or download an application form.